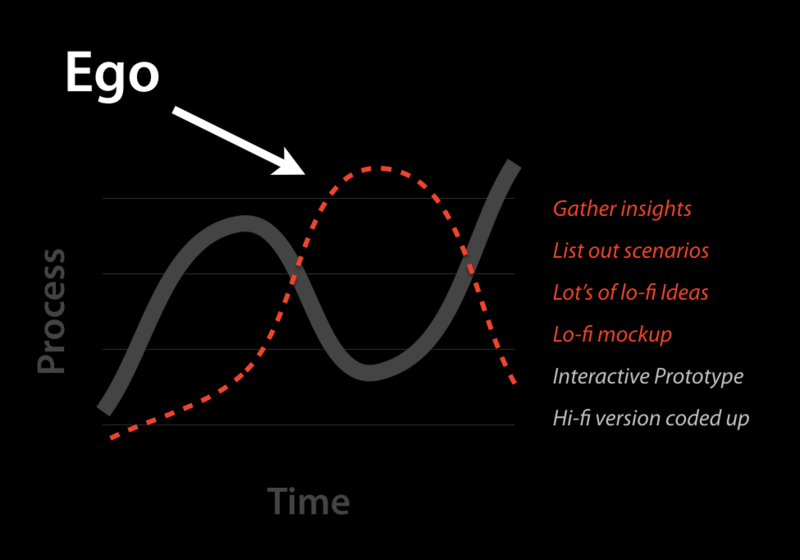 This chart shows the level of “process” a typical designer will incorporate into their designs over time. Over time, you’ll pick up some process here and there, mostly out of necessity (that’s that first hump). Then, after you’ve got some experience under your belt, you’ll almost certainly start abandoning process (what I call “the slump”). This pattern happens like clockwork. The actual timeline may differ from designer to designer, but I see the same pattern all the time. So… what exactly is “the slump”, what causes it, and what can you do to avoid it? 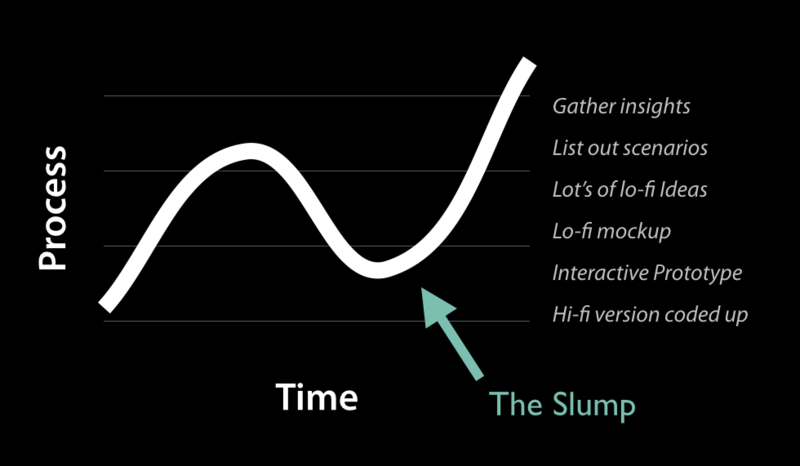 The slump is a naturally occurring phenomenon that I see in most, if not all designers. It almost always creeps in soon after you start getting comfortable with your craft. It’s a subtle thing. Probably something you won’t have even recognized in yourself until someone calls you out on it. It’s a deterioration of design process. It’s an “Ive been doing this a while now, I’m a good designer, I know what the user needs” false narrative. It’s starting a new design project and going with the first idea that comes to you, instead of first spending time to sketch out a bunch of ideas. It’s jumping straight to pixel perfect mockups, or straight to code without putting much thought into who the design is for, and what they’re trying to accomplish. It’s laziness, and it’s driven by ego. As your design skills increase, your ego will inflate along with it. If you produce good work, your ego will constantly be stroked. Likes on Dribbble, positive comments at work, from friends, or from clients all add to the problem. An inflated ego leads you to believe that you can do no wrong. That you instinctively know what is best for your users. That you can skip all of that boring process, and jump straight to later stages of the design process. But unfortunately your ego is wrong. Great designers eventually recognize the power of process in their designs, and pull out of it. It’s not easy. It means that you’ve got to admit that you don’t have all of the answers. You’ve got to admit that you don’t know what is best for your users. You’ve got to deflate your ego. Quite the opposite actually. Process frees you. It allows you to consistently create great designs. Making insanely great products has a lot to do with THE PROCESS of making that product. If you’re new to design, why not just bypass The Slump altogether. You can do this by learning to embracing process early on, and by not allowing your ego to get in the way. If you’re an old-timer, and you find yourself in the slump, no worries. Now is the time to change. Decide today that you’ll no longer be held back by your ego. Now is the time to drop your ego. Do this, and you’ll be well on your way to great designs.